Sicilians often complain that their road signs are ridiculous, hopelessly misleading or simply wrong. They are probably just using this as an excuse for their wild driving. This one got me so confused I even swerved onto the wrong side of the road. Is there an underground cinema? A tiny weeny cinema hidden behind the car? Is the car on offer for anyone who wants to go to a drive-in movie? What do you think it means? Answers in the comments box, please! it means there is a cinema on the lower level of the building behind the fence..where the car is parked! I think it means that we are in Sicily where the bizarre is the norm! I guess it is the meeting point for cinema visitors who are let in to the cinema just few minutes before the movie starts. “Queueing up here” could be the meaning? – I have strange experiences with Sicilian road signs, too … more than one time I took the wrong side road … – the reason is the philosophy of arrow signs: An arrow to the right, on the left side of a crossing means? Oh yes! I’ve been tricked by one of those. 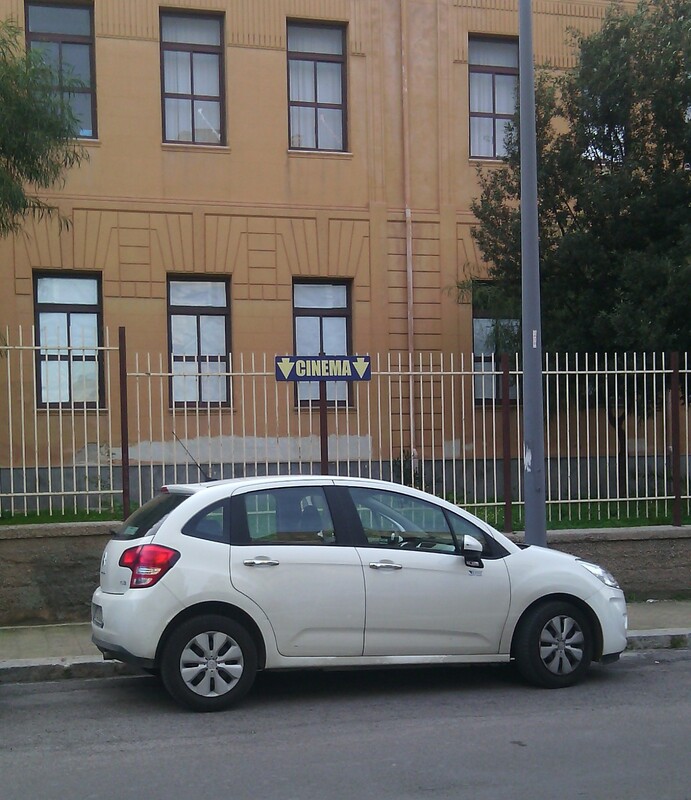 The sign is in Catania at a bus stop and it means you can queue here for the bus to the cinema an Acireale. The “Cinema” sign across the street is for the queue for the bus to the cinema in Palazzo Adriano. There’s … people getting it on in the car??? … outside a school may not be the ideal place…! Oh, remember they aer Italians of course….very passionate…..
Is the sign detachable? That could provide a clue. You mean like a game? Where you can move it if you are able to think of an even more ridiculous place to put it? Errr … and what is now the solution? Please tell us.